There used to be hundreds of seafood canneries all along Alaska’s coastline. Two people are involved in documenting and preserving some of that rich history in order to share it with others. Anjuli Grantham helped her family beach seine on the west side of Kodiak Island when she was growing up. It was the same place that an old cannery site had once operated. “My early childhood memories are playing in cannery rubble,” Grantham said. Now Gratham’s a Kodiak-based Alaska historian working as the director of the Historic Canneries Initiative, a part of the Alaska Historical Society. The initiative is a state-wide grassroots effort to help educate people about the history of the seafood industry in Alaska. “We’re looking at all fisheries but mostly on canneries because they’re such magnificent, dilapidated structures all along Alaska’s coastline and very little attention’s been paid to the documentation and preservation of these places,” she said. These places, the old cannery sites, have been around since 1878 when the first ones opened in Sitka and Klawock. Their popularity grew over the next 100 years and hundreds of processing sites popped up along Alaska’s coast line. “It was really important to have processing sites on the fishing grounds because there was no refrigeration and so you had to be putting up fish nearby where people were fishing otherwise you know how quickly fish will go bad,” Grantham said. Canning was the favorite form of seafood processing for many years. In recent decades the number of cannery sites dropped dramatically with the onset of refrigeration technology. “Suddenly tenders could go longer distances as well and so people can fish wherever and deliver to a centralized location because of refrigerated seawater and freezer capacity,” Grantham said. Now freezing salmon and other seafood is the most common method of moving the fish to market. While it lasted though, the business was booming and canned salmon was in high demand. And every can needed a label. Petersburg resident Karen Hofstad is kind of a canned salmon label expert. 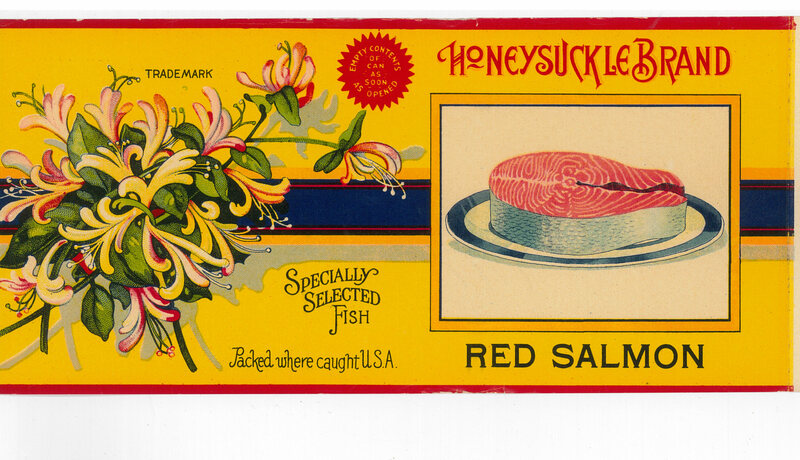 Hofstad’s collected canned salmon labels for more than 50 years. It started slow with just a few at a time but once the word spread that she was collecting many people came forward giving her what they had even anonymously sending them through the mail. She’s proud that she’s never collected them over the internet. About 300 of the labels are still on the original tin cans. 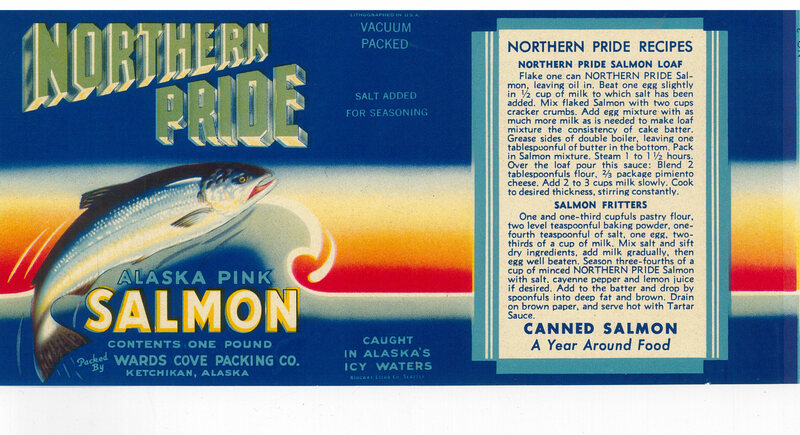 Along with collecting canned salmon labels Hofstad found herself researching the history of them. Hofstad has been carefully archiving all of her labels and plans to eventually donate her collection to a museum. Limited funding for the Historic Canneries Initiative has been pieced together from multiple sources: the Alaska Historical Society, Alaska Seafood Marketing Institute, Alaska Sea Grant, Alaska Historical Commission, and individual donors.